One of the loveliest magazines ever published has to be Victoria. I began reading as a girl in 1992, and was heartbroken when Hearst forced the magazine's closing a few years ago - and not for lack of fervent readers. Hoffman Media has brought this beauty back as a bi-monthly, and each issue has gotten better and better. What makes Victoria special? Most women's magazines are about fashion; Victoria is about beauty. Most women's magazines are about trends; Victoria is about style. 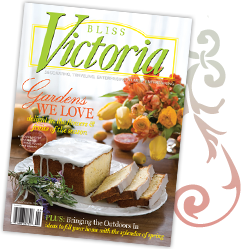 Most women's magazines are about the latest and greatest; Victoria is about what has stood the test of time. It's a beautiful escape to a place where time slows down and the finer things are appreciated in loving detail. So book yourself a $4.95 vacation - the next issue will be out February 24th.